Twisly North Lodge in Catsfield, near Battle, Sussex sleeps 8 people. 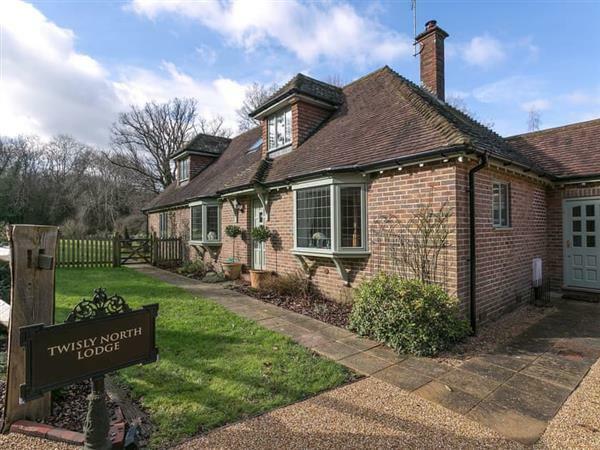 Twisly North Lodge near Battle is situated in a private and secluded setting within the grounds of the owners’ home; Twisly North Lodge is a comfortable and beautifully decorated detached property. Twisly North Lodge provides stylish accommodation for friends and families in the beautiful Sussex countryside. The Lodge has an extensive garden with a small water feature, leading to ancient woodlands which are a haven for wildlife, including deer and badgers and regularly has buzzards circling overhead! It also has a terrace and all-weather table tennis table so you can enjoy a little family-friendly competition. Two bedrooms are conveniently situated on the ground floor, with two more on the first floor, one of which has a delightful balcony overlooking the gardens. Visit the historic market town of Battle and explore the art galleries, antique shops and tea rooms, as well as the site where the Battle of Hastings took place in 1066 overlooked by Battle Abbey, built by William the Conqueror as penance on the orders of the Pope. You may even catch a re-enactment of the battle staged by 1,000 warriors, many on horseback. Sussex is also famous for its spectacular bonfire night celebrations which occur from September onwards in different villages and towns throughout the county each weekend, culminating in Battle in November. The beach at Hastings is a short drive with its iconic black net huts, pier, castle ruins and fish and chips. The medieval Cinque Port town of Rye with its cobbled streets is also nearby, and in the other direction, Bexhill, Pevensey, Eastbourne, Lewes and Brighton all make for great days out. The historic spa town of Tunbridge Wells is also only a short drive if you need some great shopping, and don’t forget to sample some of the locally produced wines at the many vineyards in the area. There is a leisure centre at nearby Bexhill, as well as bike hire, fishing and golf. Excellent train connections are available to London for further sightseeing opportunities. There is a beach 4¾ miles from Twisly North Lodge near Battle. With the shop and pub ½ mile from Twisly North Lodge. The nearest restaurant is 1½ miles from Twisly North Lodge. Living room: With 42 Freeview TV, Nintendo classic computer game, wooden floor and patio doors leading to garden. Kitchen: With breakfast bar, electric oven, induction hob and dishwasher. Utility room: With microwave, fridge/freezer, washing machine and tumble dryer. Bedroom 1: With four poster super king-size bed. Shower room: With shower cubicle, toilet, heated towel rail and wooden floor. Bedroom 3: With double bed, 18 Freeview TV and doors leading to balcony. Oil central heating, electricity, bed linen, towels and Wi-Fi included. Travel cot and highchair. Welcome pack with toiletries. Large lawned garden with terrace, garden furniture, table tennis and barbecue leading to private area of ancient woodland. Balcony with outdoor furniture. Private parking for 4 cars. No smoking. Holidays at Twisly North Lodge run from Friday to Friday. For a better idea of where Twisly North Lodge is, you can see Twisly North Lodge on the map below. You can find more large holiday cottages (that's cottages which sleep 8 or more people) in East Sussex. If you want to see more large cottages, have a look at large cottages in East Sussex. Twisly North Lodge is in East Sussex; should you be on the lookout for a special offer, you can find all the special offers in East Sussex. It's always worth checking to see what is on offer at the moment. Do you want to holiday near Twisly North Lodge (UK10690), you can see other cottages within 25 miles of Twisly North Lodge; have a look to find your perfect holiday location.